LUSH VALLEY | what does the American Dream mean to you? This is the LUSH VALLEY blog. An interactive live art event, LUSH VALLEY invites audience members to abandon their spectator hats and become key players in shaping an alternative national ethos through real-time video interviews, citizenship tests, lectures, voting and historical hallucinations. Have a hand in building LUSH VALLEY, your own idyllic-yet-realizable society, and rediscover this country as the home of differences. LUSH VALLEY is set in a government office staffed by eight immigration officers who process audience members nightly for citizenship to Lush Valley. The LUSH VALLEY experience features everything from intimate monologues delivered to individual audience members to surreal comic book group scenes and choreographed sequences of bureaucratic alienation performed by the entire company. Within this complex framework, a narrative built around the hopes and worries of a cadre of immigration officers transpires as they question each other’s motives and ethics in granting and denying citizenship. During the show each night, real-time audience feedback shared through person-to-person interaction, texting, on-site kiosks and online social media is incorporated into the proceedings. This production has evolved through a very open, public collaboration that helped define the project through online dialogue (via blog and facebook), in-person community think tanks, video interviews and public art actions. Director Kristin Marting, dramaturg Yana Landowne, and video artist Tal Yarden (along with writers Robert Lyons and Qui Nguyen and designers Oana Botez, Chris Kuhl, Clint Ramos, and Jane Shaw) created LUSH VALLEY, a live art participatory performance that chases the elusive idea of the American Dream. 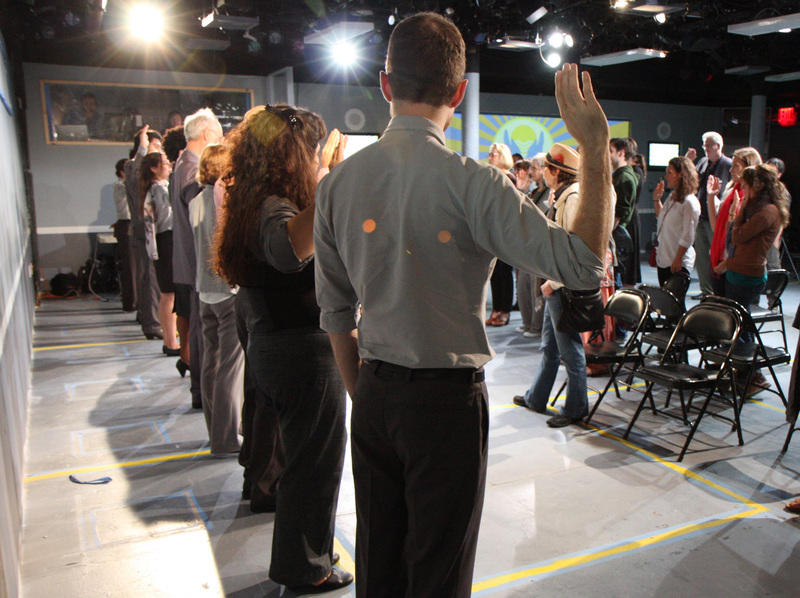 The performance began in April 2010 with our first think tank & continued through our premiere on September 11, 2011 at HERE. We are currently planning a tour to 3-5 American cities leading up to the 2012 election. We would like to thank everybody for coming out and seeing the show. It’s been a great two weeks of performances, and every night had been a very unique and fun experience thanks to our diverse applicants who helped in building Lush Valley. The photos of our Lush Valley applicants taken during the show can be found here. A big thank you also to all our contributors who helped shape the show over the entire process through workshops, think tanks, readings, etc. It was a pleasure to be part of this great community. Anonymous, Alexandra Beller, Jamie L. Bennett , Richard Brundage, Nicole Burman, David Cote, Rima Fand, Gia Forakis, Vanessa Gilbert, Sally & Fred Harris, Rachel Jendrzejewski, David Koren, Dominik Landowne, Leeda Marting, Donna Roseman, Lake Simons, Carl Skutsch, Kathleen Turco-Lyon. This week has been very exciting for all of us – Suzi has returned to New York and joined us for rehearsal! Monday was a big catch up day for her and we talked through the entire show, all her scenes, songs and dances. For the rest of the week we continued working on Wanda’s solo texts and her scenes with Jason or Ernie and made some great progress by finding the humor and little details which Wanda’s character brings into the show. The full cast days during the week very much focused on dance and song. After the run last Saturday, Kristin had the fabulous idea of changing Georgie’s rap into a fantasy sequence and now the entire cast gets a chance to join in into a funky hip hop dance choreography, uncovering some unexpected dance potential in some of the actors! Great fun and considering that the whole choreography was designed and rehearsed within a day, an encouraging balance to a rather bumpy run thru on Thursday with very little and at times slightly challenging audience. Yet, these rehearsals are an important reminder that the show builds upon its diverse audience and that the officers will face different applicants every night. But we started all fresh and confident on Friday morning filming Wanda’s TED talk, officer interview and declaration as well as some of the footage for Georgie’s rap fantasy. Check out this preview of Lush Valley in Time Out New York’s Fall Preview edition! We are getting excited to build Lush Valley with you, our audience members, and the production dates near. Get your tickets now! We have continued working on fine tuning scene work this week, as well as making sure each transition is as smooth and specific as possible. On Thursday, we focused on the think tank section of the show, where each officer helps their group create part of the new Lush Valley Oath of Allegiance. We are trying to get each officer to engage their think tank group as productively as possible, so that we end up with an Oath that represents every one of our new Lush Valley citizens. 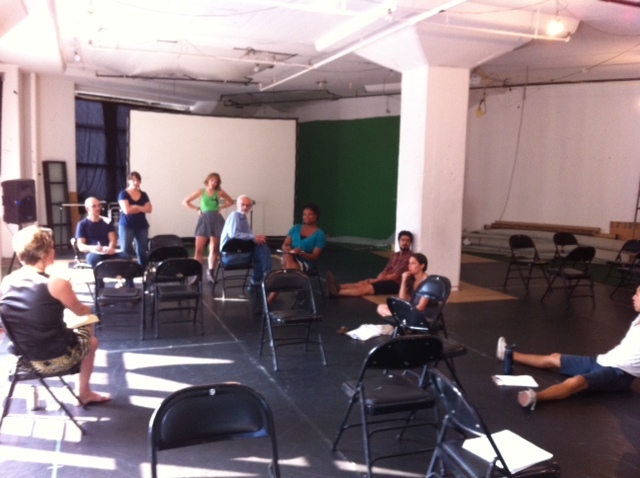 On Saturday, we had the pleasure of having about 15 audience members visit our rehearsal space for a run through. These rehearsals are always the most enlightening, because we need our Lush Valley applicants in order to figure out the traffic patterns and timing of the show. We found a lot of things that were working really well with audience in the room, and some that needed tightening up. The dances in the show can be a bit tricky for the Lush Valley officers to navigate with audience members in the room, so it was great to see those sections as they would be in performance so that we can adjust accordingly. We also were able to see how the various paper materials in the show – from intake forms to checklists to voting ballots – were fitting in to the entire piece, and how we need to tailor those to fit the needs of our audience members. We are excited to get deeper into rehearsal next week, as we speed towards tech and the beginning of previews on September 7th! Stay tuned for more updates!